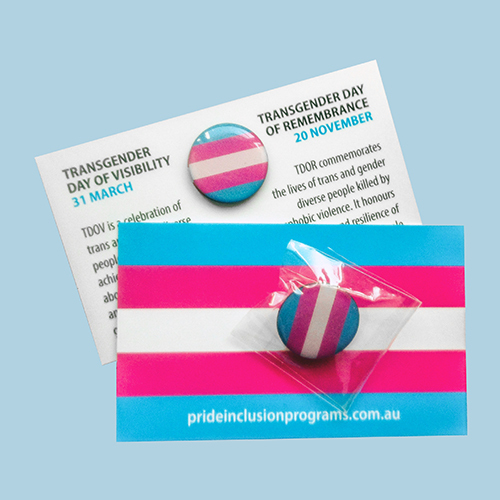 These solid steel Trans & Gender Diverse pins are designed to complement your LGBTI inclusion initiatives, and promote Transgender Day of Visibility and Transgender Day of Remembrance. The T&GD badge can be worn on clothing, pinned to your lanyard or pinned to desktop partitions, notice boards or compendiums. It comes with an information card about the two days of observance for T&GD people. These T&GD badges can be purchased individually for $3.75 for PID members or $3.95 for non members.